Our Mailster integration is a great way for site owners to be able to separate their newsletter subscribers into separate lists based on which membership(s) the user is currently subscribed to. Once configured properly (following instructions below), MemberPress will automatically add/remove subscribers to/from your Mailster Lists automatically based on their active Memberships. The integration also supports a "Global" list which all new subscribers can be added to -- a catch-all list if you will. Download and Install the popular WordPress Mailster Newsletter plugin and activate it. Go to your WordPress dashboard and navigate to Newsletter -> Settings. And configure the Mailster plugin as you wish. Be sure to create at least one List. We recommend a separate list for each Membership level though. In your dashboard head to MemberPress -> Activate -> Addons and click to install the Mailster addon. 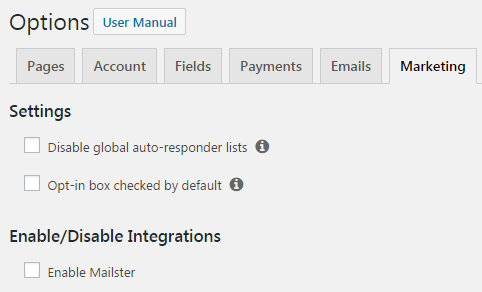 Once it's installed, activate it and you'll see the Mailster integration available in the "Marketing" tab of the MemberPress Options page. Once you have completed the steps above, by default, MemberPress will automatically add users, whether they've paid or not, to the list you set as your Global Mailster list. MemberPress never removes a user from the Global list. Once you have Mailster enabled, a new option becomes available under the "Advanced" tab of the Membership edit pages. This option allows you to select a list that only members who purchase that Membership should be added to. Members will be automatically added to, or removed from this list depending on their current Subscription status for this Membership. This list must be different from the Global list you have specified in the Options, and should be different from other Per-Membership lists as well. This concludes all the necessary steps needed for this integration. Your users will now be added to and removed from various lists based on their Subscription status to your various Memberships.